Many watch fans, including some who have been buying and collecting for decades, would likely be amazed at the number of watch manufacturers that have high quality timepieces on the market. Even more surprising in this electronic age, is how many watch manufacturers in Switzerland are still producing high quality mechanical watches. Armand Nicolet watches fall into that category. While the company isn’t “new,” exactly, they’ve sort of reinvented themselves in recent years. Founded in 1875, the company created elaborate mechanical watches with complications for sale to the public while also making movements that were sold to other manufacturers to use in their own watches. This business model worked well for about a century, until the “quartz crisis” of the 1970s nearly put the company out of business. The company significantly cut back on production while sitting on a large quantity of already-assembled movements. In 1987, Willy Nicolet, the son of the company’s founder, partnered with Rolando Braga, an Italian watch enthusiast, and the company reinvented itself as a modern maker of limited edition, high-quality timepieces. Read on for the full Armand Nicolet watches review. The build quality is exceptionally good. Most of their watches use 316L stainless steel for their cases, which is a highly corrosion-resistant form of stainless steel. Some models have stainless steel cases with gold bezels, while a few models have gold or rose gold cases. These watches feature rock-hard sapphire crystal to protect the watch face, which is exceptionally resistant to scratching. Many models also have sapphire crystal on the back of the watch case, which will allow you to observe the movement inside. Water resistance ranges from good to excellent, with some diving models rated at up to 300 meters water resistance. These watches feature company-designed and assembled mechanical movements that were created and built at their factory in Tramelan, Switzerland. One thing that is particularly interesting about the brand is that some of their limited edition models use vintage movements that were made in the 1960s. These are movements that were built with the intention of being sold to other companies for inclusion in their own models, but were, for whatever reason, unsold at that time. With modern modifications, these vintage movements are now included in a few Armand Nicolet watches, allowing you to have a brand-new, 21st century watch that has a brand-new 1960s movement inside of it. Aside from the innovation that you’ll find by using vintage mechanical movements in new watches, you’ll also find innovation here in the form of complications. Many models have day/date complications, and others have chronograph features. The no-hands HS 2 model features Jumping Hour functions and an analog readout that displays the hour, minute and seconds. Styling is mostly traditional, with colors in the black/white/silver/gold range. You won’t see pinks or blues; these watches tend to evoke a bygone era. Watch straps are leather or stainless steel, and models that include leather strap usually offer the strap in a choice of color. Most of the models in the current line offer manually wound mechanical movements, though a few have automatic movements. Case sizes are mostly in the 40mm range, which makes them not too small or not too large. Many models are limited editions, with some being available only in quantities of a few hundred units. This is especially true of the models that feature new old stock vintage movements, as those tend to be available only in limited numbers. 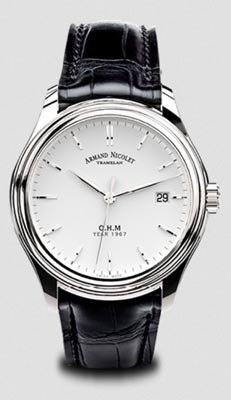 Care and maintenance of Armand Nicolet watches is relatively straightforward. You’ll want to store your watch away from extremes of temperature and strong magnetic fields, as these can affect the performance. You will likely need to have your watch serviced every five years or so in order to ensure that the elaborate mechanical movement is working as intended. This will involve cleaning the watch and replacing worn or damaged parts. 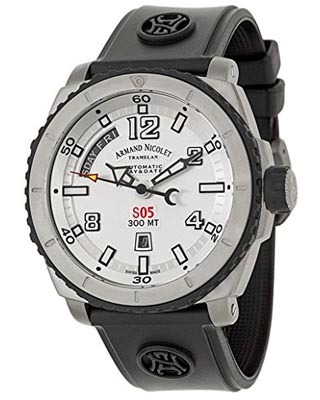 With proper care, you’ll find that Armand Nicolet watches are well-built and will likely run for decades to come. The warranty offered with the purchase is the industry average – two years. This will cover defects in materials and craftsmanship. The company does require you to register your watch with them in order to qualify for warranty service. 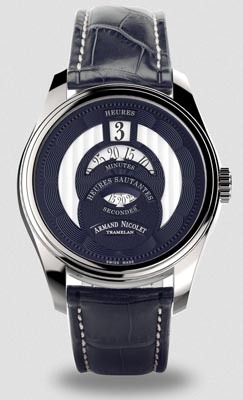 This can be done at the Armand Nicolet watches Website. The prices are in line with many other luxury Swiss brands that feature mechanical movements. You’ll find that they’re priced from roughly $1200 on the low end to $12,000 or so for limited edition models with gold cases. Most of the models near the top of the price range are limited editions. 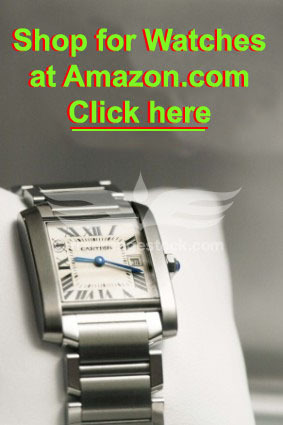 You can find this brand for sale at both online retailers and brick and mortar sellers of high-end watches. Like many manufacturers, this brand is officially sold through authorized retailers who sell at company-mandated prices. Unofficially, you can buy them at a number of online retailers, many of whom will offer their own warranty with your purchase. This may provide your best opportunity to buy them at a discount. Be aware that the limited edition nature of the brand means that it’s unlikely that any single retailer will carry the entire product line, as many models sell out quickly. If there’s one place where this brand stands out, it’s their rather unique use of new old stock vintage movements in some of their timepieces. This offers an interesting opportunity to buy a watch with a modern design that contains a well-designed, well-tested classic movement from more than 50 years ago. They are well built, have great looks, and offer the appeal to collectors of relatively limited, but not impossible-to-obtain, manufacturing quantities. They’re expensive, but not extraordinarily so, and they’re cheaper than many better-known Swiss brands. If you’re looking for a unique Swiss made mechanical watch that will serve you well for years to come, you should consider Armand Nicolet watches.